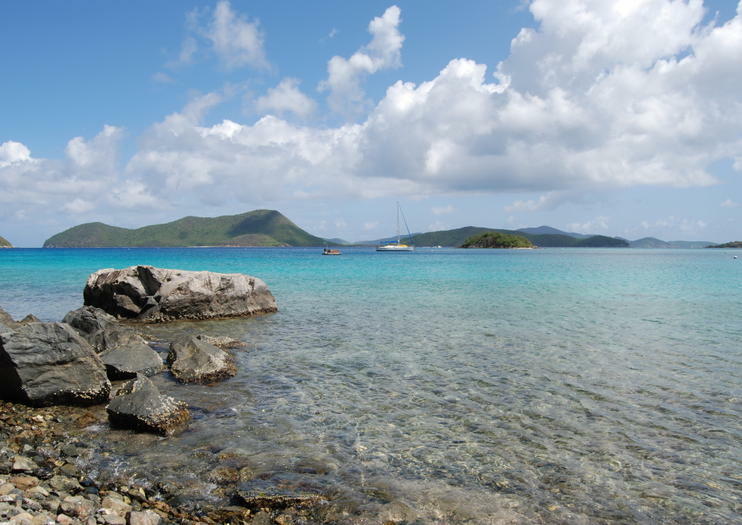 The tiny island of Waterlemon Cay on St John is a favorite among snorkelers. The sandy beach of Leinster Bay serves as the starting point for a 10-minute swim to Waterlemon Cay; it's less than a mile to the island and worth every breaststroke. The cay is home to a wealth of coral and marine life, which is what ranks it so high with travelers. Sadly, the island has seen a recent reduction in coral and reef fishes, attributed to high rates of erosion and run off from local construction. During the swim, keep watch in the sea grass for the first glimpses of marine life in the area. It’s not uncommon to see turtles, stingrays, sea cucumbers and giant starfish 20 feet below. The south- and east-facing sides of Waterlemon Cay are bordered by the region’s shallow fringe reef, whereas the west and north sides are deeper. The reef is the best spot to look for the main abundance of colorful fish and other marine life; look for large parrotfish and schools of bright blue tangs. Some snorkelers swear they can hear the crunch of parrotfish “teeth” as they grind their beaks on rocks and dead coral at the surface. Turns out parrotfish digest coral and algae that are ultimately excreted as fine coral sand, helping build the beaches we love so much. Snorkelers will find a lot of colorful coral, sea fans, sea plumes and other colorful fish on the deeper side of the reef. Keep your eye out for eels in deep holes and you may even luck out and see an octopus or two. If you are visiting the area by car, the trail that takes you to the Leinster Bay beach is about a mile's hike from the parking lot. There are no facilities available at the remote beach, so it is important to bring essentials with you. Be cautious in the shallow waters as not to step on coral or a resting stingray, and note that the western side of Waterlemon Cay has an offshore current, which is stronger during new and full moons. Charter your own private yacht and sail the day away around the U.S. or the British Virgin Islands. Create a custom itinerary with your captain and crew and enjoy a half- or full-day sail out on the crystal clear waters of the Caribbean with your private group of up to 12 passengers. Yachts are equipped with an open bar, light snacks, Wi-Fi, and some water sports equipment. Your group will spend the day enjoying the many isles and harbors of the U.S and British Virgin Islands on your own private poweboat. MV Aquarius is a brand new, 31' Wellcraft powerboat with twin 300hp Yamaha engines. This price is for a private group up to 12 guests, this is not a price per person . With our Captain, you will design an itinerary allowing you to visit the islands and harbors of St. Thomas and St. John or the exciting isles of the British Virgin Islands. The bow offers relaxing seating for group conversations, breezy tanning or turtle and dolphin watching. Equipped with the latest in audio technology, Aquarius has a Fusion sound system with Bluetooth to ensure you enjoy your favorite tunes. There is plenty of snorkeling equipment on board to enjoy the bright coral and abundance of tropical fish. You may just want to relax on a deserted beach. Or, join the party at Soggy Dollar or Foxy's. With your own private boat for just you and your group, the choice is yours.